Conflict At Work: How To Avoid? Workplace conflict can cause unnecessary stress and tension in your life and can end up wasting a lot of your productive time. It can be distracting and adversely affect your ability to do your job. 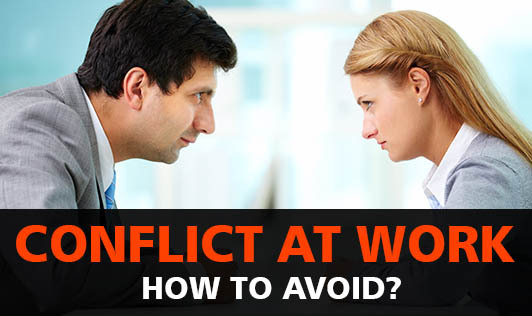 Fortunately, there are many ways to handle, manage and minimize workplace conflict. The key is staying calm and open-minded. Step 1: Gossip only about harmless subjects. Avoid talking about the physical appearance and mannerisms of your colleagues and superiors. Harmless chitchat by the water cooler helps workplace relations; indulging in vicious rumors does not. Step 2: Use positive language when discussing the company or co-workers’ personal lives. Some things are better left unsaid, especially negative comments. Step 3: Seek help and clarification about work matters from your co-workers and superiors. It will save you time, ensure good performance and help you avoid conflict. Use a bit of flattery, when addressing a colleague, and tell him you are seeking out their opinion. Step 4: Think and listen before you speak. Confront the situation head-on; stay calm and let your co-worker speak her mind; take five minutes to collect your thoughts; and then respond to the worries, accusations or complaints. Step 5: Keep an open mind when dealing with conflict. You may think you have the perfect solution to a workplace problem, but remember: Your solution may only work for you. When you try to find a solution that works for everyone, conflicts keep away. When conflicts keep away, you waste no time on them and improve your efficiency @ work.